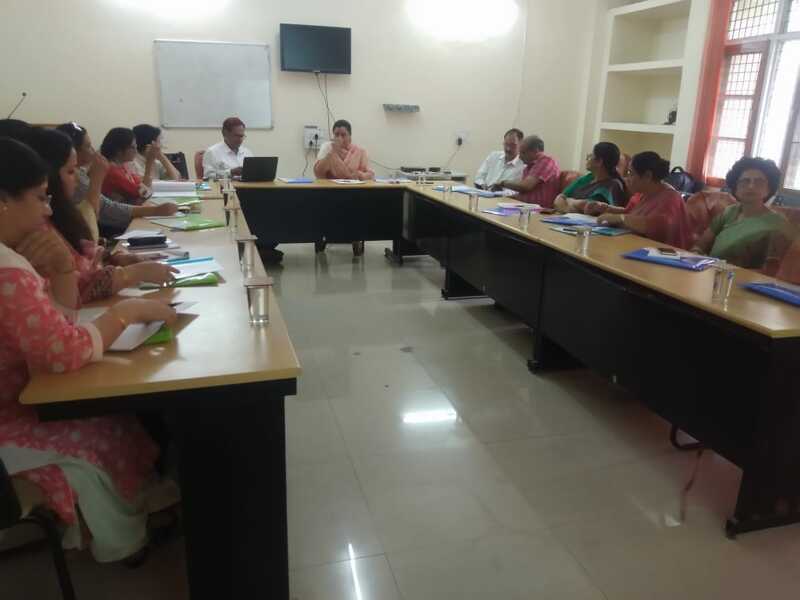 Jammu, Apr 14: Meeting of the Academic Council for the National Resource Centre in Home Science sanctioned to the University of Jammu by Deptt of Higher Education , MHRD was held on 12th of April 2019. Prof Neeru Sharma, From the Deptt of Home Science, University of Jammu was nominated as the coordinator for the Academic Council. The members of the Academic Council were nominated as per the guidelines of the NRC. They are the eminent academicians drawn from the five specializations of Home Science- Prof Jatinder Gulati ( Human Development), Former Dean Home Science, PAU, Ludhiana; Prof Naheed Vaida (Extension Edu) Former Director, Institute of Home Science, Univer-sity of Kashmir; Prof Neelam Khetarpal Emer-itus Prof. (Foods and Nutrition) Former Prof. & HOD (FN)&Dean (COHS) CCS Haryana Agricultural University, Hissar; Prof Anjali Karolia( Clothing and Textiles) Professor and Dean, Department of Clothing and Textiles Faculty of Family and Community Sciences Mah-araja Sayajirao University of Baroda ; Prof Ritu Singhvi(Family Resource Mgt) Professor College of Community and Applied Sciences, Maharana Pratap University of Agriculture and Technology. Udaipur. The Local Experts from the University of Jammu included Prof Rajni Dhingra, Dean Research Studies, Prof Rahul Gupta, Director HRDC, Prof Shashi Manhas, HOD Home Science, Dr. Samridhi Arora, Dr. Sarika Manhas, and Dr Nirojini Bhan. The Technical Exp-erts were Prof K Srinivas, Head ICT & Project Management Unit, Chai-rperson Digital Learning Cell, NIEPA, New Delhi and Prof JPS Joorel, Director INFLIBNET, Infociy Gandhi Nagar, Gujrat. The meeting was held in the Seminar Hall of the Department of Home Science. At the outset Prof Neeru Sharma ( Coord-inator, NRC) welcomed the guests and described the agenda of the First Academic Council Meeting of the NRC, which was to set up Course Objectives, time frames and Course Outlines for the Online Refresher Course in Home Science, under the ARPIT( Annual Refresher Program in Teaching) Scheme of Ministry of MHRD, which would cater to the in service teachers, irrespective of their subject, management and seniority. The Refresher Course has to be uploaded on the SWAYAM Platform of the UGC. Prof Srinivas , who is a technical expert explained in details about the need, importance and methodology of development of MOOCs( Massive Online Open Courses) and outlined the roles and responsibilities of each member of the Academic Council. He also talked about the glitches that the developers might face and ways to avoid those. Prof. Joorel provided his inputs in the matter and assured all technical support though INFLBNET. The Subject matter experts posed many queries and apprehensions to the technical experts and the matters were discussed threadbare.